I’ve wanted to go to Cutty’s for a while, after all it won Best of Boston – Sandwich shop in 2011 is routinely mentioned on the food boards. That said, it wasn’t until I heard that Guy Fieri (from Diners, Drive-ins and Dives on Food Network) filmed a segment there a few weeks ago that I decided I need to get there soon, before the crowds descended upon it. Luckily, my co-workers are willing to indulge in my food whims. Sadly, the roasted pork and broccoli rabe sandwich is only available on Saturdays, so I opted for the Spuckie (fennel salami, capicola, mortadella, mozzarella and olive-carrot salad on ciabatta) and Allison got the vegetarian version made with roasted eggplant and we swapped halves. I opted to have both pressed. 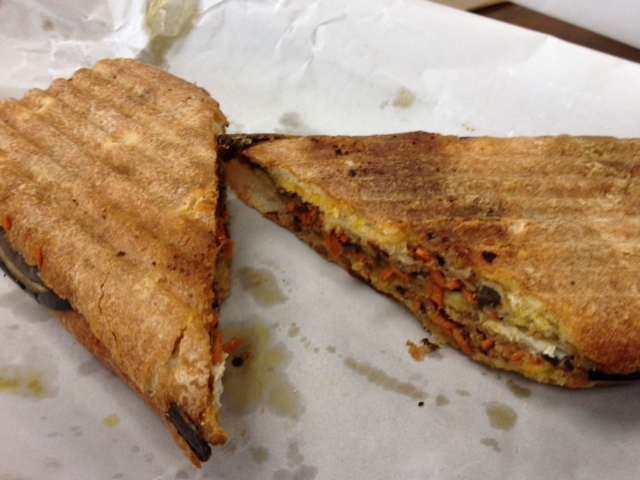 I thought both sandwiches were excellent; the meat version was heartier, but the roasted eggplant has a great smokiness. I loved the depth of flavor the olive-carrot salad brought to both versions. 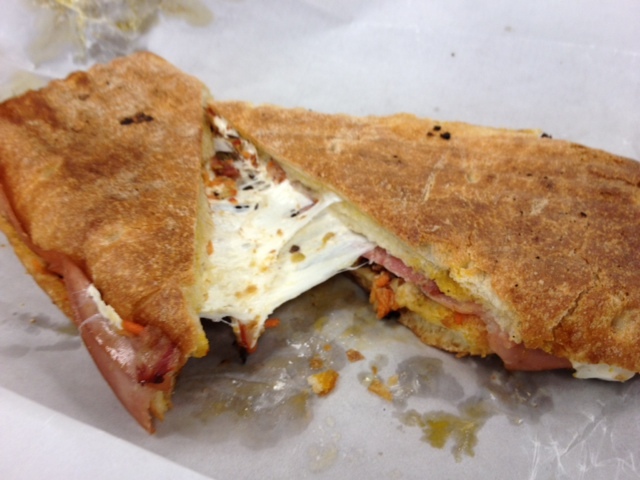 The sandwiches aren’t cheap ($9), but for the quality of the ingredients, I certainly think it’s worth it. I’ll be back to try the pork rabe sandwich.